Successfully installing Ipe Hardwood Decking requires no little knowledge about how to handle this exotic lumber. Ipe is extremely dense and notoriously hard on tools, as well as difficult to glue and stain. However, our Iron Woods Ipe hardwood decking products are incredibly durable and have their own beautiful, unique appearance and time-tested performance. Characteristics that make them extremely desirable for a variety of applications. Whichever Iron Woods Ipe product you choose, this guide is designed to outline current best practices and installation options. The use of Best Practices is an installer’s guide to superior results and satisfied customers. Iron Woods® is supplied as either Air Dried or Kiln Dried lumber depending on species selection and dimension and are typically used for decking and other exterior applications. Air Dried decking is packaged for export with drying sticks between layers which may or may not leave marks on the timber. These sticker marks are normal and can be removed by light sanding, or by weathering over time. Kiln Dried decking is packaged for export dense packed and as such will not be subject to sticker marks. It is important to note that ipe as a wood species is incredibly stable green to dry which is why it is sold in both Air Dried and Kiln Dried conditions. All other naturally durable hardwood species must be kiln dried to achieve stability in residential deck dimensions. Iron Woods® should be stored out of direct sunlight, kept clean, dry and off the ground prior to installation. Allow Iron Woods® decking to acclimate and stabilize to equilibrium humidity levels prior to installation to reduce post-installation movement. Surface checking is a normal characteristic of all wood decking though much more limited in hardwood decking versus softwood decking as evidenced by these pictures of 25-year-old Iron Woods versus 5-year-old treated pine. Larger dimensional lumber sizes and timbers may show deeper checks during the acclimation process which typically reduce once the wood reaches equilibrium. Use carbide tipped finish cut saw blades and course open bits. Seal all ends immediately after cutting with clear aqueous wax based end sealer in order to reduce end checking. Holes should be drilled as far from the board ends as allowable to reduce end splits from over torque screw heads. Use high-speed corded drills that maintain consistent drilling speeds along with course open bits. Smart-Bit and Depth Setter Driver, available from Starborn Industries, reduce furring around drilled holes and over torquing of screws. For a cleaner look consider the use of Pro-Plug System, also from Starborn Industries. Auger style bits are recommended for heavy timber drilling. It is recommended that an aqueous wax end sealer such as Anchor Seal™ be applied immediately after cutting to reduce end checking. When specifying wood products for exterior construction it is important to have realistic appearance expectations. When used outdoors wood products will not retain the appearance associated with their use in interior applications like furniture or flooring. Wood will not hold its original colour over time without cleaning and reapplication of finishes. Wood by its nature will be subject to some limited amount of natural reaction as it cannot be predicted how a natural product like wood will behave in any given environment or conditions. Left unfinished or over time without cleaning and refinishing, Iron Woods® will weather naturally to a silver grey patina. A first coat on all faces prior to installation with an oil or water based finish is not necessary but recommended even if you intend to let the deck weather. Application of even an inexpensive oil-based finish slows moisture absorption and release during seasonal moisture transitions, reduces surface checking and improves stability during the initial acclimation process. This can significantly improve project outcome if you are installing air dried decking in arid dry conditions and direct sunlight. It is important to remember that you can apply water based finishes over oil based finishes but you cannot apply oil-based finishes over water-based finishes so make sure you take this into consideration when selecting finishes. Always clean your deck using a Sodium Bicarbonate deck cleaner like Penofin Pro-Tech Cleaner to remove dirt and debris from the wood surface. Follow the deck cleaning with an application of wood brightener to remove any stains or discolourations from weathering. Oxalic Acid based wood brighteners also improve finish penetration. Make sure you allow for wood to dry thoroughly before and between any and all cleaner, brightener or finish applications. If you are sealing to maintain the colour of your deck consider using cleaners from the same manufacturer as the sealer. 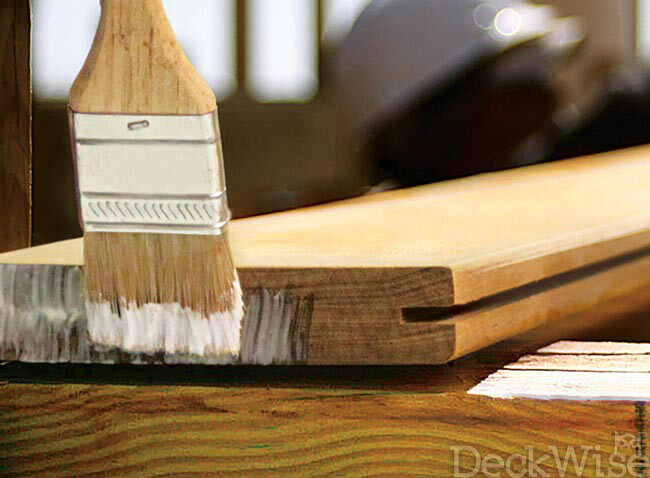 Caution should be exercised when using Wood Brighteners containing Oxalic Acid, and only used if the deck will be refinished after brightening. Oxalic Acid converts lignin in natural wood species to sugar and can accelerate the moulding process if left raw after cleaning. To maintain natural colour use high-quality oil-based outdoor finishes with UV inhibitor, fungicide and pigmented tint. Penofin Hardwood Formula is a tried and tested solution for finishing Hardwoods like Ipe. Test the finish on an offcut of decking to determine their compatibility and appearance prior to oiling the entire deck. Before application, brush and clean decking surface to remove dirt, dust and other airborne contaminants. Iron Woods® are dense, so apply one thin coat allowing time to dry thoroughly or a sticky surface may result. We do offer a Pre-finished decking product which is cost-effective in larger batches. Periodically cleaning and reapplication of finish (as needed), will enhance the appearance of your deck. The lowest maintenance approach we have found for maintaining finished decks is to treat them like you would a piece of furniture in your home. Simply clean your deck when its dirty and wipe-on wipe-off a fresh coat of finish before the finish deteriorates from UV exposure and the greying out or other forms of discolouration begin to take place. From time to time we get calls asking about black spots that appear on wood decking. These spots are caused either by mould or by a reaction of iron with the natural tannic acid found in all wood. Mold and Mildew will grow on any surface on which a food source has accumulated. This includes plastic and glass surfaces. Mold or Mildew can be cleaned with deck cleaner containing Sodium Bicarbonate, such as Penofin Wood Cleaner (see below). If deck cleaners do not remove the black stains your spots are likely caused by an iron reaction. Iron spots are often seen as black rings around galvanized steel or low-grade stainless fasteners. Small black dots on the deck may also be caused by filings from iron railings, shingle granules, fertilizers, or any particle containing iron that sits on the deck surface. 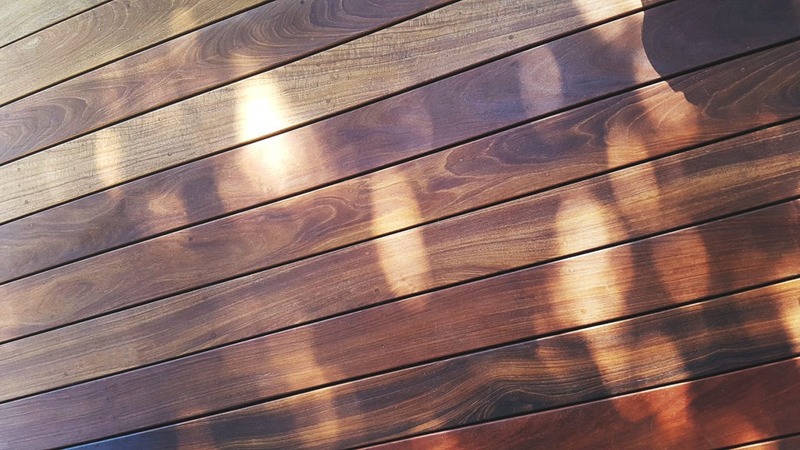 This type of black staining on the deck can be removed with wood brighteners (see below). Generally, they are supplied in a powder or a concentrated solution form and are mixed with water. Multiple applications may be necessary to remove the stain. To prevent the problem from returning the fastener may have to be removed and replaced with a higher grade stainless steel fastener. Use extreme caution when handling any of these chemicals and wear protective clothing and glasses. Do not mix these cleaners with ammonia or household cleaners. We recommend that tests in small areas on a few different boards be made before overall use on the project. Always consult and follow the manufacturer’s recommendations when using proprietary products. Iron Woods® are somewhat difficult to glue. It has been reported that marine grade epoxy. Polyurethane, PVA type III, and 2 part resorcinol types of glue have been successfully used with success in non-structural applications. Typically, in any glueing the wood should be dry and wiped with a solvent such as alcohol or acetone to remove surface oils, dirt or other conditions that may interfere with adhesion. Wood is an organic material, not manufactured, with variations from board to board. When glueing lumber it is incumbent of the architect/engineer/specifier to recognize the potential impact of the acclimation process to the appearance of the completed project. Timber Holdings USA makes no specific recommendations or warranties related to painting or glueing wood products. When using any type of glue we recommend that samples from a few different boards be made and tested before use in any project. Always consult and follow the manufacturer’s recommendations when using proprietary products. When deciding stringer spacing there are other issues to consider beyond allowable deck spans. For new construction with conventional decking and hidden fasteners we recommend stringer spacing between 12-24’’ depending on the thickness of the deck plank. The additional cost of a few extra pressure treated stringers and some extra fasteners will significantly reduce decking trim waste while increasing the overall load capacity of the deck. For residential applications, the live load requirement by most building codes is between 50 and 100 pounds per square ft. Based on this criteria Iron Woods® decking achieves minimal deflection at 16 to 24 inch stringer centers for nominal 1 inch (net .75 inch) thick decking, 24 to 36 inch stringer centers for nominal 5/4 inch (net1 inch) thick decking, 36 to 48 inch stringer centers for nominal 2 inch (net 1.5 inch) thick decking, 48 to 72 inch stringer centers for 3 inch (net 2.5 inch) thick decking and 72 to 96 inch spans for 4 inch (net 3.5 inch) thick decking. The following span calculations indicate the maximum allowable spans based on 200 lbs of live load and 300 pounds of snow load as a “worse case” residential deck scenario. Not all fasteners are created equal. There are many fastening options and systems available in the market today. Whatever system you chose it is important to remember that once selected liability for fastening performance shifts to the fastener company, so consider your options carefully and follow the manufacturer’s instructions. The use of high-quality T305 or T316 stainless steel fasteners is recommended to provide superior service life and avoid potential galvanic reaction issues related to the connection of naturally durable wood products with treated softwood substructures. If screws are to be left exposed on the face of the boards it is best to use T305 or T316 stainless on darker woods like Ipe and T316 stainless on lighter woods like Garapa to avoid staining which may result from the interaction between the natural tannins in the wood and non-stainless fasteners. Regardless of the fastening system selected, performance evaluation and selection is the responsibility of the specifier or installer. Pre-drill and countersink two holes per deck stringer intersection. Install self-drilling trim head screws. Screw penetration to joist should be a minimum of 1-1/2 times the thickness of the deck board. Drilling and screwing through the face of the deck boards provides the strongest mechanical connection. It is always recommended that you pre-drill and pre countersink the ends of the boards when using any types of system as the ends of the boards are the most susceptible to splitting. Predrill and countersink followed by screw application. Typically all commercial decks are constructed using this method. The images below show one installer predrilling and countersinking followed by another installer setting screws in a two-stage operation. Stainless steel fasteners are now available from Starborn Industries and other manufacturers in both natural stainless which can be used if you intend to let the deck weather naturally or with colour coated heads to matched finished deck colours. Iron Woods® is extremely dense and hard. The use of self-drilling, self-countersinking screws without pre-drilling creates tension or pressure on the wood fibres and increases the possibility of splitting. This doesn’t mean that you can’t use self-drilling finish head screws… it just means that you will likely split some boards especially if you over torque the self-countersinking screw heads. The same can happen if you over torque your screws when you do pre-drill and pre countersink. There is one collated self-drilling screw system that has had good results. The Muro™ Ejector™ Screw and Driver System is designed to remove fibre from the hole as the screw penetrates the deck board reducing pressure on the wood fibre. There are many collated and non-collated self-drilling/self-countersinking screws and screw systems available to the market today. Ejector™ Screws are not available with colour coated heads. Drill, screw and plug has all the mechanical benefits of the drill and screw method, however, the countersinks are deeper to allow the application of a wood plug and adhesive to cover the screw head. Typically used in wood boat construction this method offers a unique appearance. Drill Screw and Plug systems like Starborn™ Pro Plug™ provide the drill bits and plugs in a system that facilitates quick installation. Unlike most all-metal hidden deck fasteners, which can react with wood causing staining, the Ipe Clip® is moulded of a malleable plastic polymer resin coating (further adding UV & chemical resistant qualities), allowing for the natural expansion/contraction of wood decking. This rigid, hardened plastic coated, stainless steel insert firmly holds decking to joists (up to 3X more hold-down strength than other edge-mount deck fasteners), eliminating decking screws from pulling through as the deck material expands. Designed for exotic hardwoods, the colour of the plastic resin also works to further camouflage & conceal our fasteners between the board gaps for a more sleek, upscale surface. A deck, patio or terrace that is installed with DeckWise® Hidden Deck Fasteners will make your new build safer, longer lasting, more durable, and better look with a flawless, smooth surface finish. To the best of our knowledge this information is accurate: however due to the variance of products grown in nature, it is the sole responsibility of the installer to select the appropriate product for any given installation and site condition, check and follow local building codes and apply Best Practices in handling and installing Iron Woods® brand products. 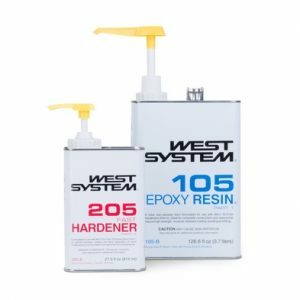 Installers should follow manufacturers recommended application and maintenance instructions when using proprietary finish and fastening products. To maximize the performance and beauty of Iron Woods® products please read this installation guide before you begin.